When you imagine a share of a company, what do think of? For some, images of a large stock certificate bearing the company name appear. Unfortunately certified paper stock, or certified shares, are quickly becoming something of the past. If you have traded shares on the stock market or have brokerage account, you probably already know that most public companies and trading on the market is no longer done by paper stock certificates. With the advent of the internet and trading of shares on a large scale, paper stocks have all but become obsolete, making way for company shares to move to digital, uncertified shares. Electronic shares are company shares that have been issued electronically, and do not exist in paper form. With nearly everything being on the internet these days, company have also moved towards digitalization and the advantages and convenience of electronic shares. Some may believe that a company can only issue electronic shares in one way. However, there are many ways that a company can issue shares. Each one is a bit different, and serve different purposes for the company. But what are certified, uncertified, and electronic shares, and how can you take advantage on making the move to paperless shares? What Are Electronic or Digital shares? Electronic shares or digital shares are shares that are represented in some form on an electronic stock ledger. These have the same properties as paper shares, just that they are recorded only in electronic form. There are no major differences with electronic and paper stocks, just one is in paper form and the other is not. The company can still issue all the various forms of its shares electronically. Other forms of securities as well. Recent technological advances have led to more and more companies issuing electronic shares. Companies must however notify the shareholders of any changes in the shareholdings of the company and also keep a record of the updated shareholder list. With electronic shares, this can be achieved seamlessly all online with notifications to shareholders via email; greatly reducing the time and cost needed to keep the cap table of a company up to date. Now that you know the difference between paper stocks and electronic shares, let’s further dive into two important terms for shares: certified shares and uncertified shares. Shares for a company can exist in two forms, certified and uncertified shares. Certified shares are stocks of a company represented on a paper stock certificate. The owner of this paper certificate would have the evidence of ownership of the company. Uncertified shares are shares that are tracked and represented in the books of a company. These shares are recorded in the company as a “book entry”, and are not represented with a paper certificate. The shareholders would be updated of their ownership by the company, the company’s transfer agent/broker with an account statement or updates on their system. While certified paper stocks may seem like a more official representation of ownership of a company, there are many more advantages of using electronic uncertified shares than paper shares. This may be the reason why all 50 states in the U.S. legally recognize uncertified shares as legal ownership, and some even prefer this method for share issuance. When you have a paper stock certificate, you would have to store it somewhere. And with all the other documents that you have printed in paper, you can misplace it and eventually lose the proof that you or a shareholder owns a part of the company. This in turn can become a legal case and cost you more than you can imagine. The paper stock certificates may not be available all in one place which is why tracking them is not easy, at times impossible. Moreover, with many investments and shares, there are chances where you can forget or miss out one or two of the certified shares that has been given from your company. This makes things difficult for you and in the end, can cost you a lot as well. When a shareholder of your company doesn’t want to hold a share of your company any more, they can easily sell off the share to someone in the market without your consent. In short, the transfer would not be on the records of your company. If the paper stock certificates are not centralized, it may be difficult to track them down for the process of auditing. It may also be very easy for the paper stock certificates to become inaccurate. Auditing should be straightforward where you can view the register to note all the details of the company. With paper stock certificates it may not be possible, while with the uncertified shares, it is possible for auditing the company easily. A lot of the public companies have been issuing uncertificated shares for many years now, and there is a recent trend towards eliminating paper certificates completely. Even though this is true, there are still many non-LLC private companies that tend to issue the stock by using the paper certificates. In addition to this, web-based systems are now offering the private companies with a much less expensive and more accessible options, thus paper stocks are swiftly turning into something of the past. But why exactly is there an emphasis on “uncertificated” shares and what are the benefits? At first, you would not need any stock certificate forms, where you require signatures from the recipients for proof of receipt. Alternatively, you can just email the shareholder the relevant details of the issuance and the company in a notice form. In case the shareholder needs any additional information, they can easily request for the same online. With this, all you would need is an accurate method for keeping track of each issued share. You would not need to send around the certificate to get all the shareholders to sign. This would also reduce the probability of disputes, with the help of the online platform. Another great thing is that you can change to uncertified shares as you go ahead without additional work for the existing certificates. Even though it might be helpful if everyone turns in their old certificates to get the new uncertified shares, it is not necessary. You would however need to issue a resolution of directors to allow the company to start recording the shares electronically. In short, if you do not want to track all the shareholders down, you do not need to. You can keep a track of all the uncertified shares along with the existing certificates in the same system. A shareholder cannot just transfer or sell the certified shares without the knowledge of the company. This is because there aren’t any physical certificates which can be sold. The ledger of the company is the official copy of all the outstanding shares. Hence, for executing a legal transaction, the shareholder would have to consult with the company in a formal procedure where ti would be recorded properly then. And with this, the company would not have to hire and pay someone else for the transfer process and can act as their own transfer agents. With the help of a proper software, each transaction can be easily documented, and even verified in an indisputable and electronic manner. Each shareholder would have access to the details as per their specific information rights. This can be fulfilled with a spreadsheet as well, but it may be more very confusing and is not often suggested.The reason is simple; it would not meet the standards of accessibility, speed, accuracy, security and so on. Now that we are clear about the benefits of the uncertified shares along with the drawbacks of the certified shares, let us understand how to issue the electronic shares in a company. How to issue Electronic Shares for your Company? There are three main ways that a company can issue electronic shares for the company: Electronic shares, uncertified shares using a spreadsheet and uncertified shares using an online software or ledger. Electronic shares are similar to certified paper stocks with one main difference, in that they exist only in electronic documents, such as PDFs. This means rather than storing all the paper stocks in some locker or storage bin, they are kept in a secure server somewhere for the company. This allows more flexibility for the company, as it is easier to move around the shares and also to keep track of a higher volume of shares as well as a list of shareholders. However, there are a few drawbacks to this method of keeping shares in electronic form. First, the legal classification for these shares are not all established. This relatively new take on holding shares has not been completely accepted by the courts, thus making these not the securist form of holding shares in a company. The second drawback is that because of the legal issues surrounding these type of shares, they may need to comply with the requirements of both certified and uncertified shares, which could cause further strain on the company and shareholders. The last drawback is that using this form of shares for the company means that the company must first gather all the paper stock certificates and convert them to the electronic shares, which can be time consuming and difficult to do. This last reason may cause some owners to avoid this type of shares for a company, especially if the company is a larger corporation with numerous shareholders. This form of shareholding requires the company to track all the shares on a spreadsheet or ledger, which would become the official record of the ownership in the company. Possibly a long time ago companies use to do this on a paper ledger, but now most companies keep all of this information on an Excel spreadsheet. This form of recording the shareholdings in a company has been around for a while, and has become more popular with the advances in tech-based software and ledger systems, such as Excel. In addition to this, many companies have opted for this centralized method of recording shares as its cost effective and is easily manageable, especially smaller companies. With a little legal help from an attorney to certify the authenticity and existence of these shares, a company is able to keep all the records on this ledger. Companies have been doing this type of share record keeping for decades, so it is already well established within the law and the courts. With these in mind though, companies have found that there are many restrictions to this as well. It’s hard to track a large amount of data with these spreadsheets, and keeping everything up to date with many shareholders is challenging as well. Try sharing and keeping a file up to date with 50 different shareholders at one time, good luck! Also the access to these files are hard to manage, and these inconveniences has lead many to migrate their record keeping to a more share based, online software or ledger. The third and the best option is to issue the uncertified shares using the web-based software that is designed just for this. Through this step, you would be able to enjoy the advantages of a spreadsheet like the flexibility between uncertified and certified shares, low implementation cost, along with the additional power of the specific web-based application like security. It should be kept in mind that this would not be a regular ledger but a web app that is more complex and organized than a spreadsheet. The web-based application can have the sharing, accounting, automation and compliance tools that are built into the system. Moreover, you would also have the feature to connect it with other devices and build things like electronic transactions, document storage, and so on. Even though most of the vendors might charge you for the software, you would be saving a lot more money that might have been lost over other alternatives. Electronic uncertified shares might not be for every business, but it can save you a lot of time and money. And which business would not want this? The process of switching is quite easy and simple. How to switch to uncertified shares? Step 2: Create a board resolution stating that the company has the authority to issue uncertified shares. Step 3: After that, you would have to amend company’s by-laws and articles of incorporation with the same effect. Step 4: At last you would be able to issue the uncertified shares, and track everything electronically on the company’s ledger. Ensure that you have an attorney advise you properly while you take these legal steps in your company. The requirements for switching may change state to state, so its best to clear everything up with your attorney before you move forward. Companies that have been using the paper certified shares are moving towards uncertified shares and the distributed ledger options as it makes the work easier and has reduced the cost to a high extent. Hence, as the time passes, companies will give up the use of certified shares and would move towards the paperless way. This may take over to replace the manual and inefficient processes, like the recording for shares and the issuing of certified shares. With the continuous advancement in this technology and its use, it would increase the efficiency and lower the costs as it does for the web-based application for the uncertified shares. Nowadays, no one needs a fancy looking physical document that shows the ownership of that person over a company. Instead, everyone just wants to have a simple yet efficient way of issuing and keeping a track of all the shares in the company. This is so that the shareholders can have access to the respective and authorized information at all the times. And since the public market has already taken up the option of using uncertified shares, it is time for the private companies to do the same. 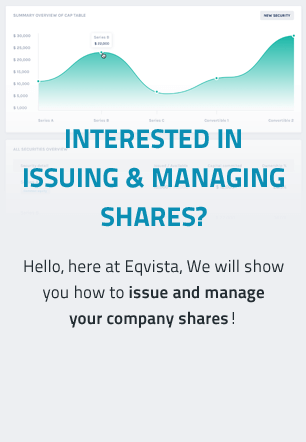 With the help of Eqvista, you would be able to easily record all the shares issued and even transfer the existing certified shares of your business.